NOTE: This is Part 9 of our ongoing series documenting the history of our company. If you’re just joining us, be sure to read Part 1, Part 2, Part 3, Part 4, Part 5, Part 6, Part 7, and Part 8. 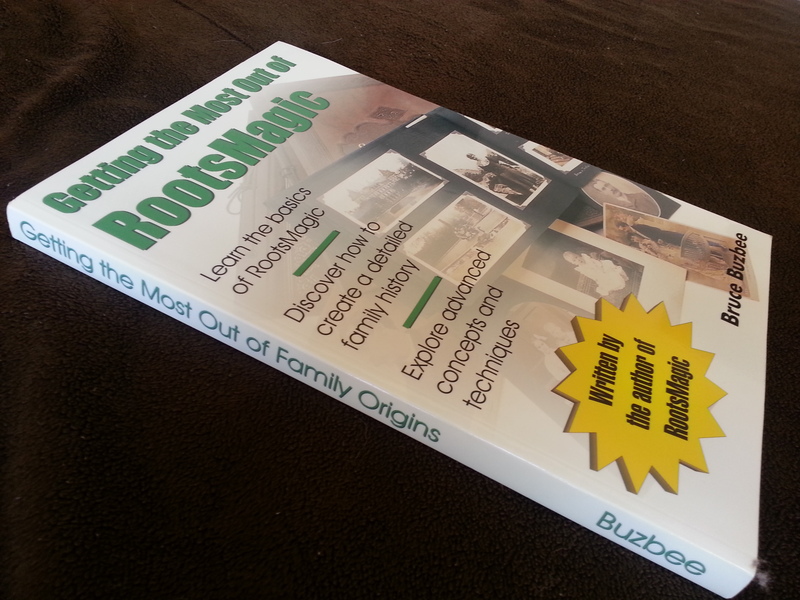 When we finally released RootsMagic 1.0, the book I had written for it was still a month or so away from coming back from the printer. I had wanted to have it ready at the same time as the program, but there was still some editing to do, and I hadn’t designed a cover for the book yet. I finally took the artwork for my Family Origins cover to help with the layout and modified the graphics and text. The books arrived from the printer the day before I left for the Southern California Genealogy Jamboree at the end of February 2003. This was the last Jamboree held at the Pasadena Convention Center. I just loaded the books and software into the car without even really taking a look at them. The first day of Jamboree, a customer brought the book they just bought back and asked me to take a look at it. When I didn’t find any damage to the book, I asked what the problem was. They pointed to the spine… “Getting the Most Out of Family Origins.” My heart sank. I knew we had 5000 books exactly like that sitting in my garage, and couldn’t possibly afford to reprint all of them. The customer wasn’t upset, and even made a comment about it being a collector’s item. I made sure to make a note of that comment. I called my wife to tell her about the book spine, and she said she already knew about it. She just didn’t tell me because she didn’t want me to be upset. When I got online that evening, I saw a big discussion about the incorrectly printed book spine. I mentioned that when we reprinted the book, we would be correcting it and that this book was now a collector’s item. After saying that, sales of the book picked up drastically. We even had customers say they never needed or bought the book for Family Origins, but they were buying this one specifically because of the incorrect spine. I still have users come up to me at conferences and tell me they have a copy of that particular book. FormalSoft, Inc. Changes Name to RootsMagic, Inc.
SPRINGVILLE, Utah, March 1, 2004 – FormalSoft, Inc. announced today that, effective immediately, the company is changing its name to RootsMagic, Inc.
“The name change to RootsMagic, Inc. reflects our commitment to the RootsMagic product line and to the family history market” said Bruce Buzbee, founder and president of RootsMagic, Inc.
Coinciding with the name change is the switch to www.rootsmagic.com as the official company website. I guess I really did say that quote above, but the reality is that nobody knew us as FormalSoft, and it was just going to keep getting worse. To get RootsMagic released in a timely manner, we had to leave out one important feature… wall charts. I had already been working on them but knew it would delay the release another 6-8 months if we tried to include them in version 1. 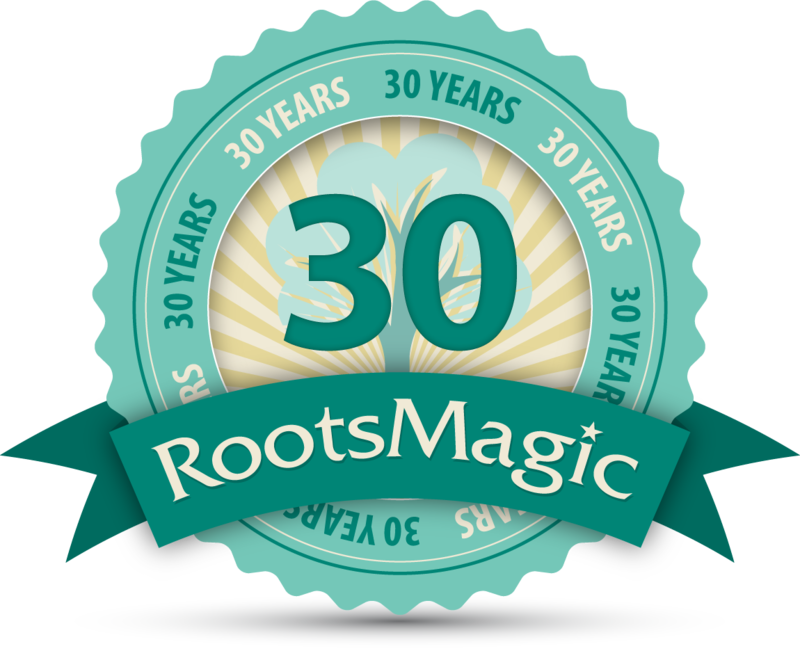 In May 2004, we released RootsMagic 2, and with it the new wall chart functionality. Around this same time, we started selling software from other companies, programs like Passage Express, AniMap, GenSmarts, and a relatively new program called Personal Historian. 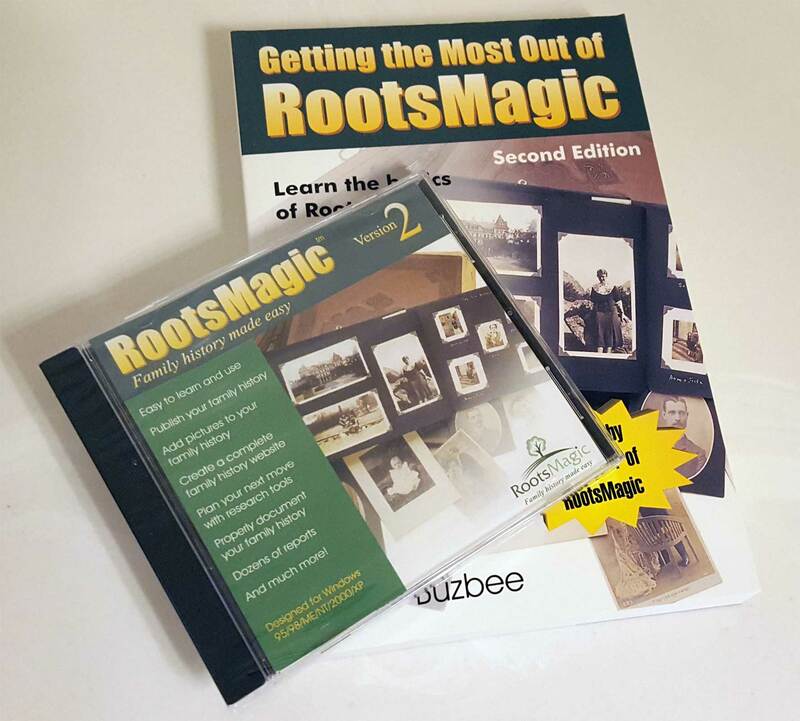 We would buy copies of each of the programs, and then resell them on our website along with our own RootsMagic software. I got to know and become friends with the developers of each of these products. In May 2005, the Southern California Genealogy Jamboree moved to its new location at the Marriott convention center in Burbank, California, and we were there to exhibit as usual. Unfortunately for the Jamboree, the move took its toll on attendance that year, and most of our time was spent talking to the other vendors rather than with users or customers. But what was a negative for the Jamboree led to the most important development in our company’s history. With nothing better to do that talk with other vendors, I spent a lot of time visiting with Michael Booth, the developer of the Personal Historian software we had been reselling. I really liked the appearance of his screens, especially compared to the bland screens and graphics in RootsMagic 2. I found that Mike created most of his own graphics and toolbar buttons, so I asked him if he would be interested in designing new graphics and toolbar buttons for the RootsMagic 3 I was working on. I offered to pay him, but he still claims to this day that he offered to do it because he was sick of looking at RootsMagic’s ugly screens. While Mike made good on his offer to do some new graphics, this was only the beginning of the biggest (and best) decision I ever made for the company. And the keep on rolling see the fourth word. I love it. Ah, you changed it I love it, life is to short to anything but have fun! We love all of the changes over the years. Made for ease of working on our family histories. Came a long way from some of the clunky programs I tried. 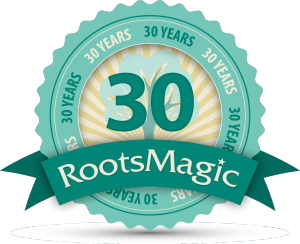 We have passed Roots Magic name onto anyone who wants to work on their genealogy. I’ve been working on our genealogy since early 1960’s,pre-computer days. All handwritten, snail mail communications. I like the format, easy to see at a glance family. Thanks for a great program. Congrats on 30 years! 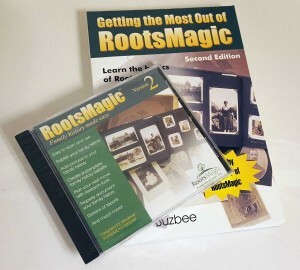 Going to the early days of genealogy software I had used Family Edge for sometime until your first program appeared on the market I used Family Origins until it died and switched over to Roots Magic when it was an infant and love it more as time goes by. I taught Genealogy classes for years at our local community college and today am the Senior Researcher for the Norwegian American Genealogical Center in Madison WI. I share my love for the program with our clients and also promote it when I teach classes here at the Center. Keep up the good work and best wishes for many more anniversaries! I remember Family Tree Maker, and I bought a copy of it at some point, but when Family Origins came out I much preferred it to FTM. Then FO seemed to “disappear”, and I thought it had gone the way of all old software. I was jubilant when I found out that it had been resurrected as RootsMagic! I came back to the party after RM v6 came out. That was about the time I started actively doing family history again after a hiatus of some years. I’ve also bought every other family-history-related program you guys have put out. And thanks for the historical series, I can’t wait for the rest of the story! I first got involved with Roots Magic 4 when The Church of Jesus Christ of Latter Day Saints said they were discontinuing PAF which I had been using for years. I really enjoyed being able to see both sets of parents at the same time instead of having to toggle between them. You have had a great experience to get where you are today and it inspires us to make sure we never give up on a idea we have. I won’t anyway. I love reading your experiences of making greater things happen. Thanks a lot for your hard work. I’ve been using FO from at LEAST back to V2 or 3? I was disappointed when it went away, but elated when I found Roots Magic! I tell everyone how good RM is, especially those who may be starting/want to start working on genealogy! Keep up the great work and THANK YOU for developing RM! With a job move to MD in 1980 on a 4-day work week, I went to D.C. on Fridays to the National Archives, and searched many reels looking at Passenger Immigration lists. Also since my grandfather had acquired a “homestead” of 160 acres, I used their offsite facility to do further research. My paperwork was getting unmanageable, and looked for a way to put it on computer. I don’t remember what software I used, but put some of it on my son’s Radio Shack Commodore. Later I got my own simple computer, and started my genealogy database in DOS. Other family had FTM program, and I imported their gedcom files. I don’t know what version of FO I started with, but used it until RootsMagic came out. I have been very pleased with RootsMagic and the ease of using it for someone who had not had any computer training (only at work with an estimating program for printing). Tech Support has gotten me through several computer crashes, and also loss of RM7 software. Thank you Bruce Buzbee for sharing the company story. Thank you for all that you have done! When it is ready, I am positive I will enjoy the sync much more than the impatient ones!!! Thank you, Thank you, Thank you!